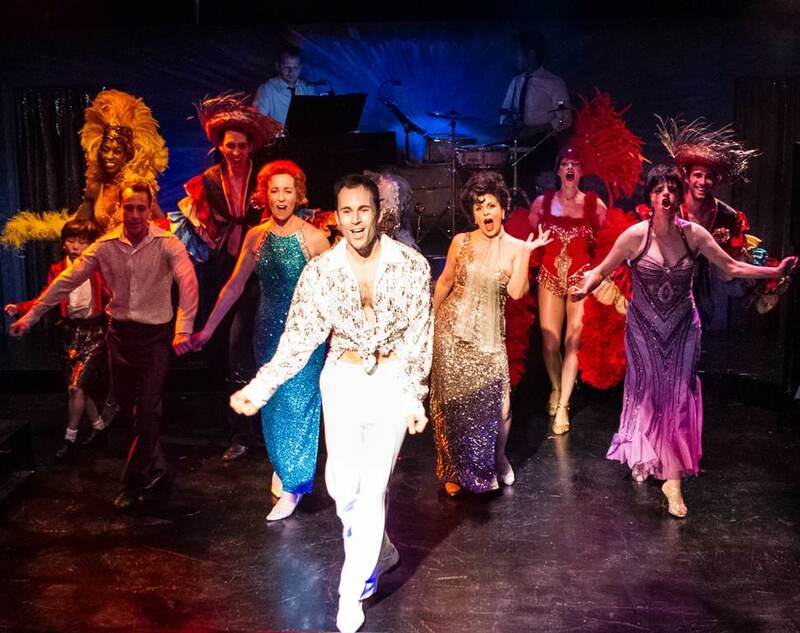 Andrew Bongiorno (center) as Peter Allen and the cast of The Boy from Oz. Big and bold performances, bright retro choreography and a collection of fizzy pop songs by songwriter Peter Allen make up the latest good-time outing at Celebration Theatre where the west coast premiere of The Boy from Oz is sure to pack ‘em in for the duration of the run. And it should. 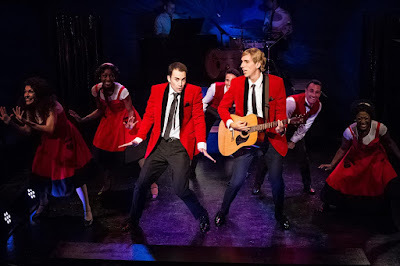 One of Celebration’s strengths is taking large scale musicals, such as this, that typically fill a Broadway stage and reinterpreting them for a modest theater like their current home at the Lex. They did it with great success in their award-winning production of The Color Purple several years ago and they’ve done it again with The Boy from Oz. Over the course of two and a half hours, director Michael Sheppard and his cast bring back the devil-may-care exuberance of the ‘70s and ‘80s in this thoroughly engaging glitter ball of a musical, narrated by Allen as he relates and highs and lows of his singular career. Allen was a flamboyant entertainer, eternally optimistic in the face of disappointment, and a natural musician who learned how to strut his stuff at a very young age. During his 10-year collaboration with Carole Bayer Sager he wrote hits like “Don’t Cry Out Loud,” “Everything Old Is New Again” and “Quiet Please, There’s A Lady On Stage.” He wrote “I Honestly Love You,” for his friend Olivia Newton-John, which became her first number-one single in the U.S., and he also won an Academy Award for co-writing the theme from Arthur, “The Best That You Can Do” with Bayer Sager, Burt Bacharach, and Christopher Cross. These and another 20 of his best songs make up the score to The Boy from Oz. He was discovered by Judy Garland, who took him under her wing and on the road as her opening act, launching his international career. He met and married her daughter, Liza Minelli, which would end in divorce 7 years later when the couple could no longer ignore Allen’s homosexuality. And, in the end, he would leave his own joyful mark on music in an era when AIDS would claim far too many ahead of their time. All this, and more, is chronicled in this loving homage. Hugh Jackman, Australia’s latest reigning king of the theatre, won a Tony Award for Best Performance by a Leading Actor in a Musical in 2004 for his portrayal of Allen in the Broadway production. Now, Andrew Bongiorno steps into the limelight, summoning up buckets of charm in a fresh, likable performance that captures the spirit of the entertainer and the heart of the man. 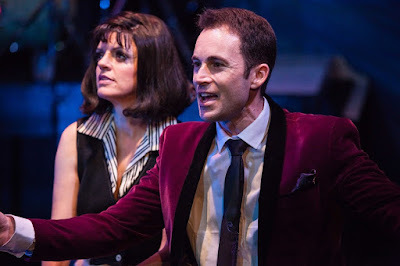 Bongiorno’s non-stop energy sets the pace as each of the major characters who impacted his life appears. From Judy Garland (Bess Motta), to Liza (Jessica Pennington), to his mother (Kelly Lester), to long-time lover Greg Connell (Michael Mittman), each one plays an important part in Allen’s glitzy show biz world. 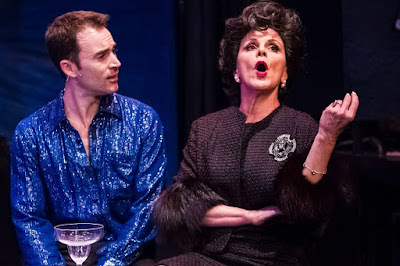 Motta and Pennington tear into their performances with fiery gusto, Motta embodying the cynicism and quirky mannerisms of Judy in her later years with uncanny precision, and Pennington’s big doe eyes brimming with vulnerability and pain. Bongiorno and Mittman’s playful chemistry turns bittersweet when AIDS comes knocking, as it did so unexpectedly and so often in the mid ‘80s, and an 11 o’clock number by Lester poignantly explains why few in Allen’s life were privy to his real feelings. 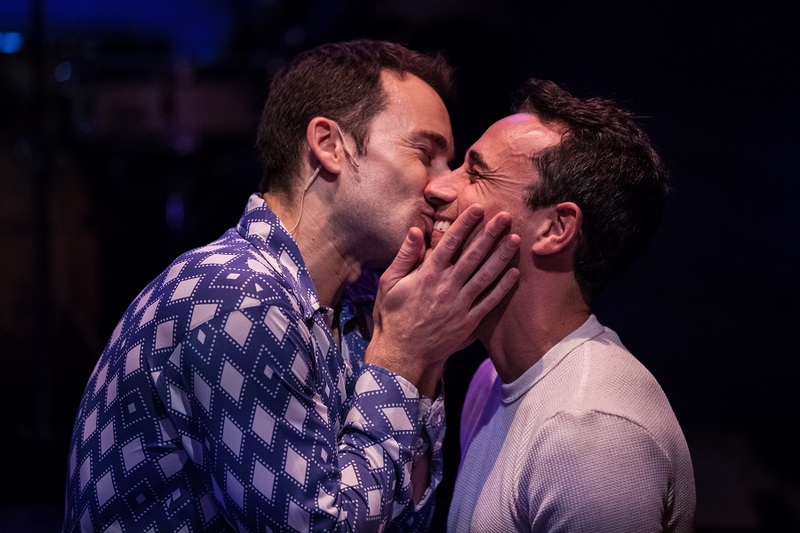 One of the most exciting aspects of the show is the way choreographer Janet Roston brings the various moments of Allen’s story to life via dance, and she does it on an incredibly tiny stage. Her rousing episode of Australian Bandstand is full of the wholesome teenage joie de vivre that characterized the 1950s, and, in the ‘60s, her sensual bump-and-grind moves easily take you back to New York’s Studio 54. An ingenious bit of casting allows her to create a Rockette kick-line that is hands-down a high point, with a statuesque (and what looks like 7-foot tall) drag queen (Marcus S. Daniel) owning the stage at one end and a petite Rockette doll (Shanta’ Marie Robinson) at the other. The ‘70s come alive with pelvic thrusts and splashy disco moves, and a sequin-filled finale choreographed to Allen’s signature song “I Go To Rio” gives the show a big nightclub finish, putting a jubilant button on a life that wasn’t lived quietly. Indeed, Allen himself said the only way to go out was to go out loud and he most certainly did. Michael Mullen’s terrific costumes are a rainbow spectrum of vintage creations: bright red jackets and skinny ties to capture the Bandstand era, iconic looks for Liza that eerily resemble photographs we’ve seen of the singer throughout her career, and enough polyester and sequins to show off Allen’s lanky frame with style. Musical director Bryan Blaskie builds the show musically until it peaks in an all-out party on stage. Best of all, you can hear every single word. 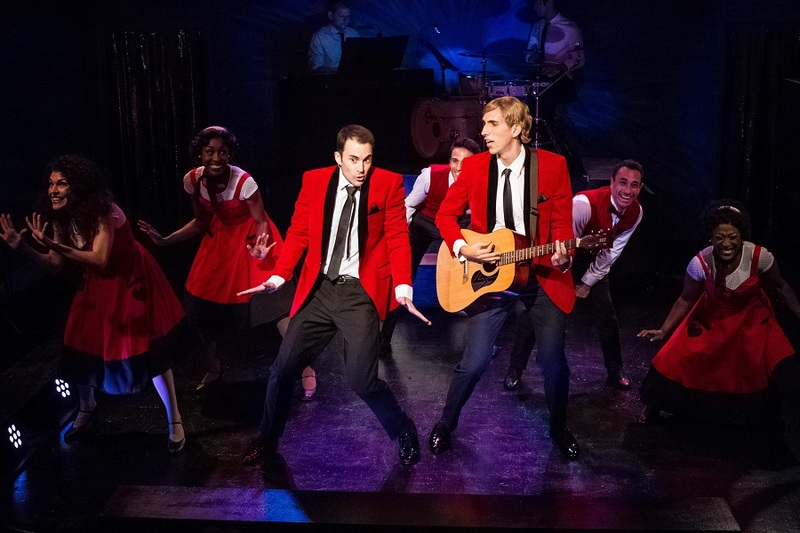 If it’s true that good things come in small packages, then Celebration Theatre has cornered the market on how to re-imagine a big Broadway musical for an intimate theatre experience while keeping its showstopping pizzazz intact. The fun of The Boy from Oz is proof positive.